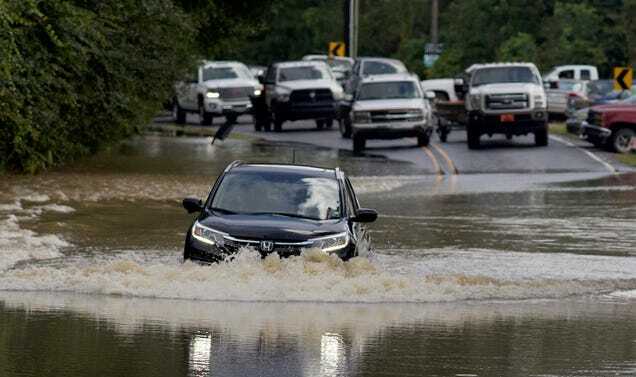 Extreme, catastrophic flood events like the one that swamped Louisiana last month are becoming more likely because of climate change, according to a hot-off-the-press analysis by the National Oceanic and Atmospheric Administration (NOAA). The study found that the record rainfall responsible for last month’s epic floods—the worst natural disaster to hit the United States since superstorm Sandy—was made at least 40 percent more likely by global warming. The researchers arrived at that conclusion by applying a new but increasingly popular statistical approach called “weather attribution.” Details of the analysis, which is currently under peer review, can be found in the open-access journal Hydrology and Earth System Sciences. The no-name storm began around August 11th when a low-pressure air mass rumbled up the Gulf of Mexico, stalling out over the Louisiana coast for several days. As I explained at the time, a combination of high air and sea surface temperatures fed an incredible amount of moisture into this system—moisture that was then hauled inland and unleashed over neighborhoods from Baton Rouge to Livingston. Over several days, the storm dumped three times as much rainfall as Hurricane Katrina, with some locations receiving 20 inches of precipitation in just 48 hours. Rivers overflowed and flooding ensued. By August 17th, flood waters had claimed 13 lives, more than 30,000 people had been rescued, and over 60,000 homes suffered damage. For some, it’s easy to look at an event like this and pinpoint the fingerprints of climate change. After all, records show that the frequency of heavy downpours has increased along the Gulf Coast since the mid-20th century, which makes sense because a warmer atmosphere can hold and dump more water. And yet, the majority of meteorologists are still reticent to discuss climate change in their reporting, due to a combination of cultural and political factors, and the relative novelty of scientific research tying planet-wide changes to weather. That’s why the attribution studies now being done by NOAA and others are so critical. They are building a foundation that legitimizes the connection between extreme weather and climate change through statistics. In the new study, scientists at NOAA’s Geophysical Fluid Dynamics Laboratory and elsewhere examined the risk of devastating, three-day flood events along the central Gulf Coast from the early 20th century to the present. Observational data told the researchers that the frequency of extreme flooding had indeed increased in this part of the country. Using climate models, they were able to reproduce a similar uptick in flood frequency by increasing the concentration of greenhouse gases in the atmosphere. That’s the attribution part. According to NOAA’s models, the odds of a Louisiana-like downpour drenching the central Gulf Coast have increased by at least 40 percent since 1900. It’s worth noting that changes in the frequency of heavy downpours are unlikely to be limited to the Gulf Coast. Climate models show that while some areas, notably the southwestern United States, are expected to become drier this century, others, including the midwest and Pacific Northwest, will likely see an uptick in the number of extreme rainfall days. The point of doing all this is not to arrive at some arcane statistical conclusion. It’s to help emergency responders, planners, and the public understand how weather risks are changing so that we, as a society, can be better prepared. The planet is changing whether we like it or not, and it’s time to adapt.